Country Living: Be sure to check other pages for properties that are somewhat larger than this as you may find something just right there. Keep scrolling; there is a lot in here. And don't forget to look under "Farms" as well. 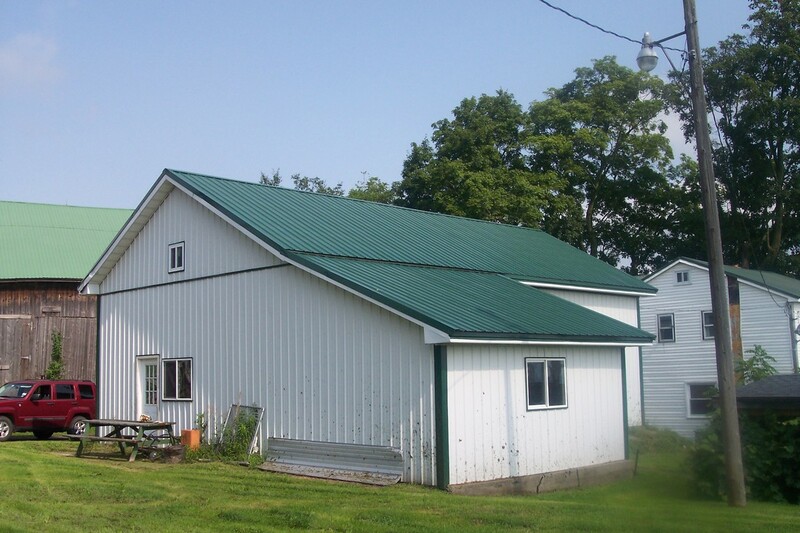 Some of the "Acreage" properties have barns, so if you don't need a home, that is another spot to search. SOLD INSTANTLY #1145 Northeastern Montgomery County - on just over 1/2 acre, we now have a 238 year old colonial that has just been totally remodeled. It has 2538 square feet of living space and you will be proud to own this one. Nicely shaded lawn, not far from the Mohawk River. In fact you can see it clearly from the second story when the leaves are off. One near neighbor separated by 2 garages and she never goes outside. And there won’t be any others. There are Norway and silver maple trees and a few locusts, all fairly large, and there are plenty of flowering bushes. There is a new steel roof over the home (photos were taken before installation). It has vinyl siding, all thermopane windows, and the basement walls have been insulated. Additional insulation was added to walls of 2 rooms and to the attic. And you’ll find a brand-new oil 2 zone hot water furnace and a newer tank. There is a 12-16’ back deck, partly covered with a roof, and it has sliding glass doors. And by each of the other outside doors are small covered porches. Water is from your choice of dug wells. We have been using just one and can report it has very good water. Oil-fired hot water, the cheapest around. There is a new 200 amp electric entrance and quite a bit of rewiring and plumbing was done. Inside, there is an open floor plan between the kitchen, dining room and living room. 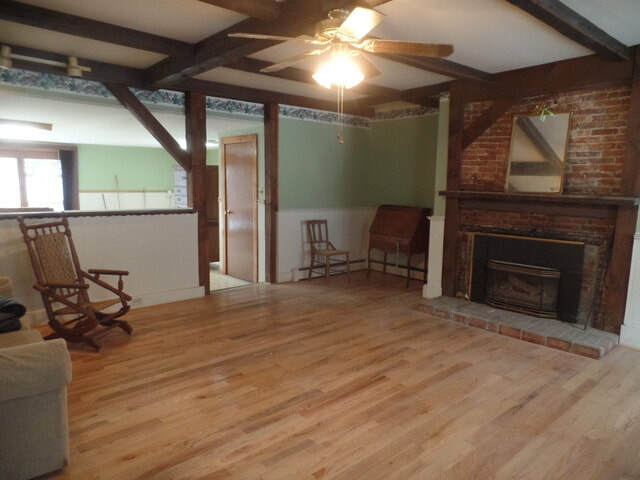 The living room is 19x19’ and has a beamed ceiling, an original fireplace (set up for gas logs, but can also convert back to wood), a new red oak floor and wainscoting. The kitchen is large and well-lit with lots of cabinet and counter space, Corian and tile counters and island. And there is a pantry. Lots of window space too, so it’s bright. 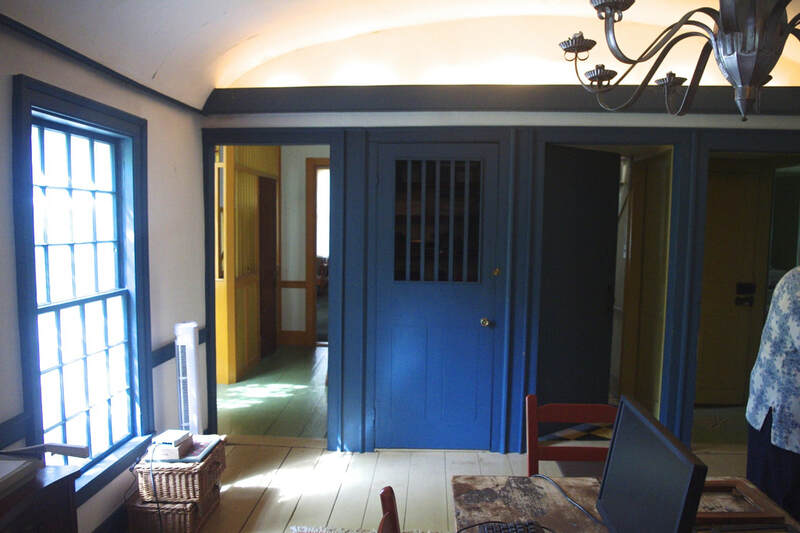 On the east end are 2 rooms with an arched doorway between them. One is carpeted (Berber carpet) and the other has refinished plank floors. They are each about 10x19’. Between them is a wide downstairs hallway, which runs parallel to the axis of the house, unusual for a home from this era. Behind it is a very large full bath and laundry. The laundry portion is hidden behind curtains. There is a huge mirror and a makeup/vanity counter besides the usual one with the sink. Upstairs there is another wide hallway, also parallel to the home’s axis. On one end is a 19x19’ bedroom with refinished plank floors and a mock fireplace. The other side has a 10x12’ bedroom with refinished plank floors, and a 12x20’ bedroom with 12” of closet space and a mock fireplace. There is also a new full bath, with an oversized shower, no tub. Off to the side is an 18x18 walk-in attic. If you like to see trains go by, this is a good place for it. The tracks are 20’ below and 100’ beyond the property boundary. A tiny pond separates them. 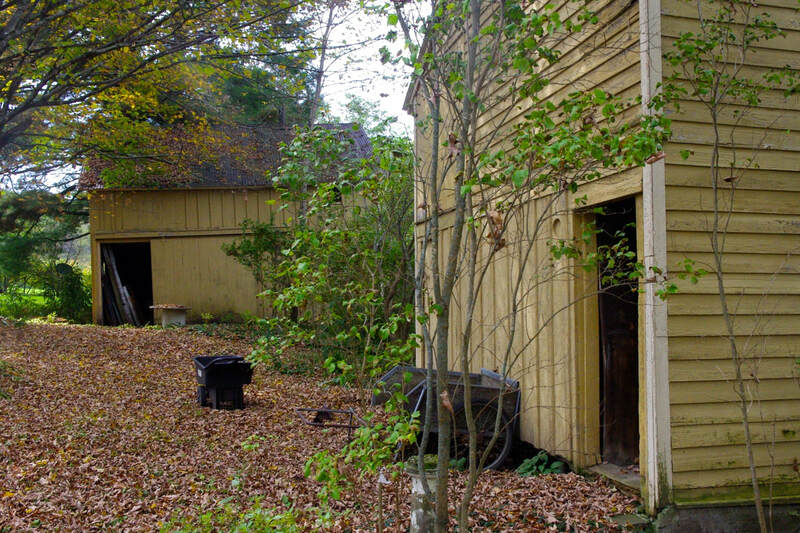 There is a one car garage on the property, but it is in poor shape and contributes no value. The taxes are just over $3000. We do not take any of the tax deductions you may qualify for. This is owned by Vinyard’s Choice and we can creatively help a qualified buyer get the place . #1137 - Central Herkimer County NEW LISTING 3.75 acre hobby farm is fully fenced and is located in the Town of Manheim outside of Little Falls. Attractive rolling sidehill terrain. You can live comfortably here and have a lot of fun on the side. Lots of room in the buildings for kids, cars, or critters. The two-story, 100+ year old 10 room farm house, has 2444 square feet, 6BR and 10 rooms total. The home is complete with a full bath on each level, hardwood floors, walk-in closets in all 6 bedrooms, forced air heat, and a spring-fed water supply. It has oil hot air heat and a fireplace as well. It is also complimented by an ultraviolet light water purifying aystem, a new electrical entrance, a Briggs and Stratton standby generator, vinyl siding, and a Bilco entrance door to the partial basement. The wrap-around porch overlooks the in-ground swimming pool and provides a magnificent view of the valley, one that has to be seen to be appreciated. The two-story 20x50’ gambrel style barn is in good condition with 45 +/- tie rails, Presently in use for raising heifers and hay storage. The concrete stave silo and covered Patz barn cleaner are in working shape as well as the barn bridge to the second story. A second 25x45 barn is in need of repair. The property is enhanced by a spacious 30x45 two-story garage which features two overhead doors with automatic openers and two walk-in doors, along with a concrete floor. #1134 - East Central Montgomery County - With State Forest across the street and no one to either side, you enjoy a surprising amount of privacy here for 1.7 acres (417’ road frontage, too). The lot is mostly open, has an ample mixture of sun and shade and has a very good drilled well (no sulfur either). There is also a shallow well (good tasting water, but not as much) and a cistern, which is no longer used. The home has a new metal roof, new leachfield ($7000 to install), a newer furnace (oil hot air with a wood add-on). It is very well insulated and features siding of Hardi-Board, not often found in this area because it’s so expensive. It is not flammable and does not ever need new paint (well, almost never). Wiring has been updated (200 amp, on breakers) and the plumbing was installed to make it easy to drain in case you take a winter vacation. It has 1278ft2 of living space. Inside are a living room with oak floor, a real paneled ceiling, and a woodstove, an eat in kitchen, also with oak flooring, a family room with wide plank flooring, a fully tiled bath, and 3 bedrooms, plus a laundry with a tile floor. One bedroom has the refinished plank floors, another has new laminate, and the third has carpet. There is a walk-in upstairs closet, a number of replacement windows, some new light fixtures and there are enclosed porches on both the north and south sides. Included are a stove, refrigerator and dishwasher. An enclosed vestibule protects the main entrance. An extra deep (15x22’) single car garage is attached to the home. There is a 14x24’ shed in very good condition and a small kennel. One of the porches features a dog door. ​This is in the sought-after Fonda school district and is priced to sell at only $89000, a very good price for a home in this kind of condition, especially in this area. Taxes are very low - $1200 total. ​Seldom does such a historical property come for sale. The Pinney Tavern was a life-long restoration project for its former owners, now deceased. And you can reap the fruits of their careful labor. It is on both State and National historic registries, which protects the exterior (but not the interior) from out of character changes. 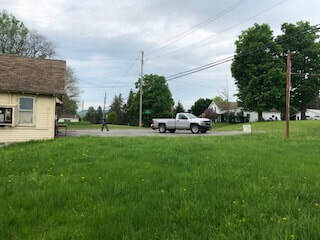 There is about an acre of land here, within the Historic District of a very quiet tiny hamlet outside Cooperstown, with another 34 available (see below for information on that), beautifully landscaped, and set back from the road. The Tavern was a spec project, only built in 1790, by George Hyde Clark (of Hyde Hall fame) and sold within the year to Joshua Pinney, who operated it as a tavern in addition to using it as his residence. It is well-kept and large, with over 5248 square feet under the roof (not all can presently be used for living space), And it is very original, restored exactingly where it needed work. 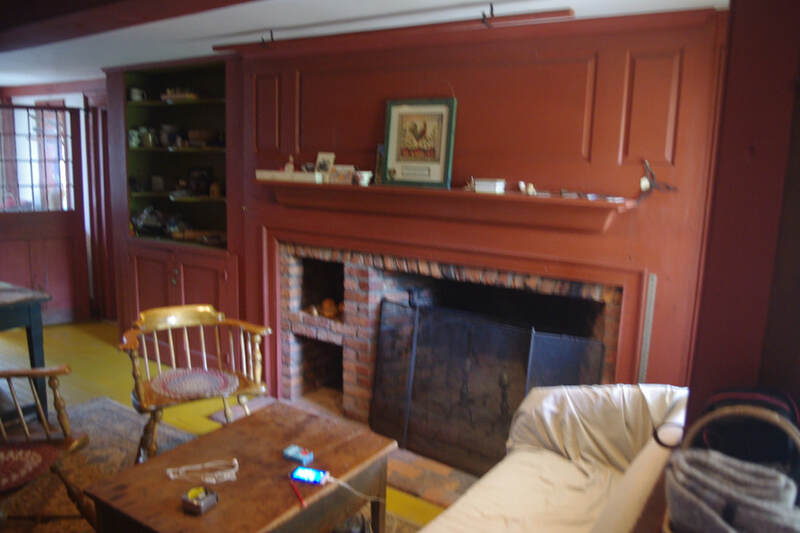 There are 7 – count 'em 7 – Rumsford fireplaces here, refinished plank floors throughout, wavy-glass 12/12 windows, period-appropriate stenciling, faux painting, a dry & brick-floored basement, tons of storage space, found in 2 attics, a large 2 story woodshed and also in far more built-in cabinets and nooks and crannies than would normally be found in a home of this era. It has a total of 18 rooms, 6 of them bedrooms, and 3.5 of them baths. A two story portico with a wooden block faux stone lower enclosure towers across the front and a circular drive complements the grand feeling one gets when you first see the property. Heat is hot air and radiant floor (one room) and there is a new hot water heater and oil tank. All appliances, a safe, and all light fixtures stay. A good drilled well services the home. 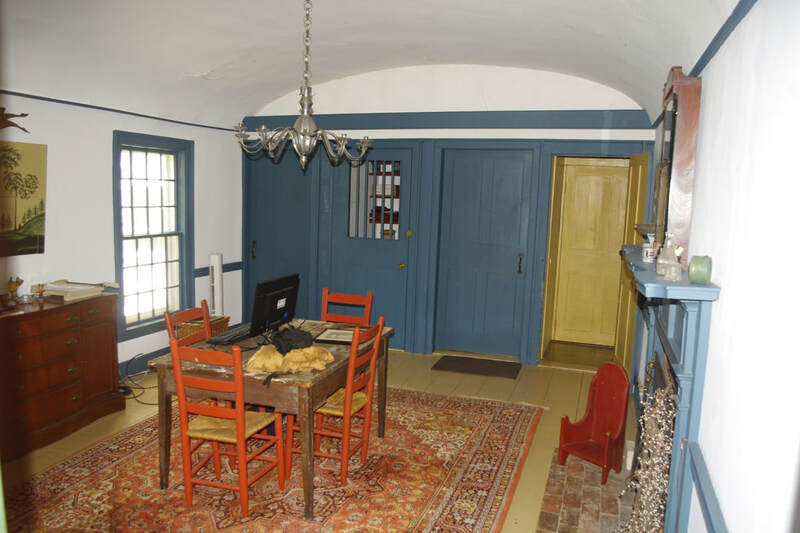 This is a home that begs to be used for additional purposes, professional offices, home business, B&B, whatever is in keeping with its historical character. It's proximity to Cooperstown pretty much guarantees success as a B & B. Let me take you on a room by room tour. As you enter the home, you see a 10' wide Front Hall, with a hand painted checkered floor and a wide Cherry staircase. 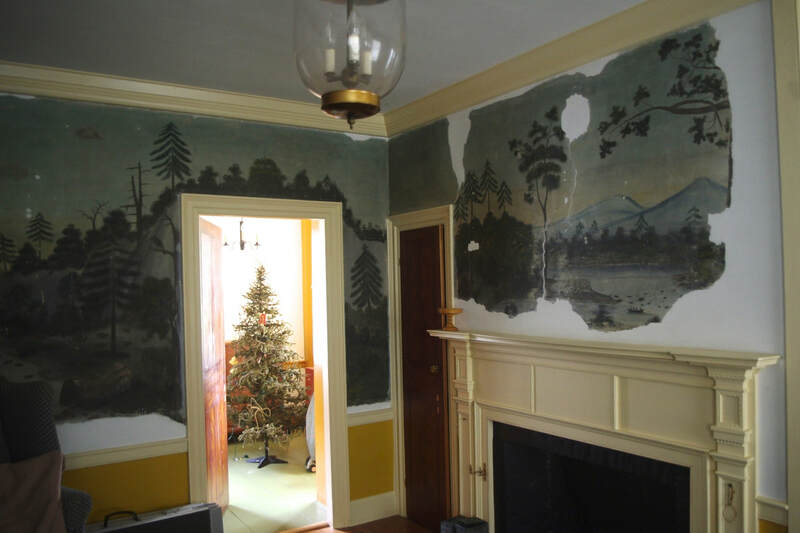 To the right is a Parlour (16x16') where they unearthed a hand painted mural thought to be painted by William Price (son-in-law to Rufus Porter). Price's only other known such work resides in the world-famous Winterthur Musuem. The tavern's Liquor Room (11x16') is off this, with a wooden-barred repository for the bottles, which were in turn stored in drawers and cabinets. To the south is the South Parlour (16x17'), a bright sunny room with built-in bookcases bay windows, a pocket door, fireplace, and gilded accents. 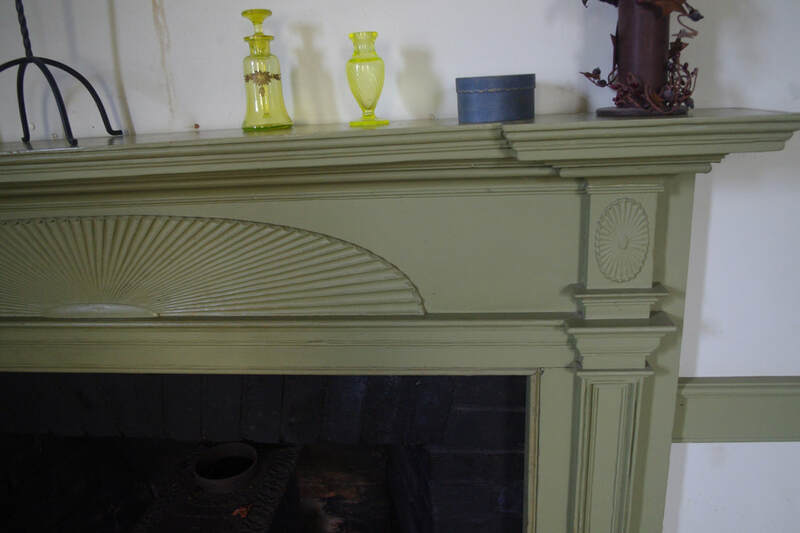 On the other side of the front hall is the Library, with more built-in bookcases, another fireplace, and the remnants of an original circus poster (from the 1700's ) on the wall. It was first used as a bar room and is 16x16'. To the east is a Study and a stenciled cherry plank-floored Bedroom with a fireplace and its own full bath + a writer's nook. Its dressing room is now a room walled by closets. South of this is the arched-ceiling Dining Room (13x20'). It features another fireplace, many built-in, recessed lighting, a pull-down candelabra, a dumb waiter (no longer used). 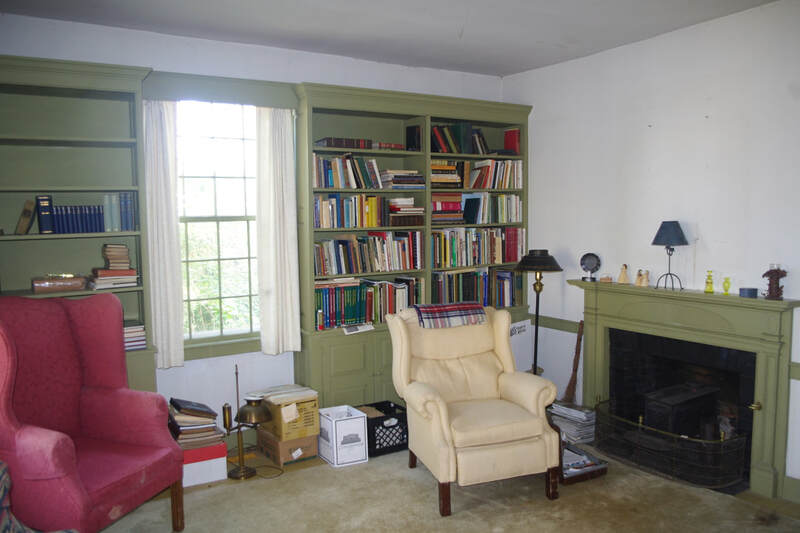 Behind this is the Kitchen and the Keeping Room, now used as an informal dining room/study. This area is 16x28' and has a half bath, a fireplace, warming overs, many built-ins and two porches off it. 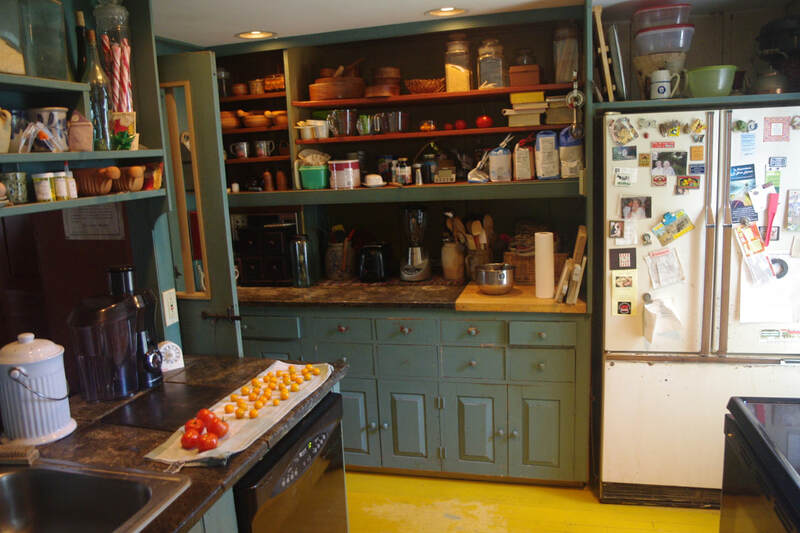 The section used as a kitchen is smaller and utilizes shelving rather than cabinets. It is fully functional. A 17x44' 2 story Woodshed is behind this area. It can be accessed from either floor. There is a beam across the top which is curved, giving additional headroom as well as provoking comments. 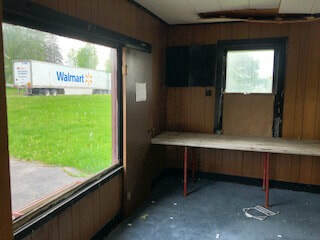 This area can be used for additional living space or an apartment, a home business, or just leave it as it is for storage. At the head of the Upstairs Front Hall, was the Ballroom. 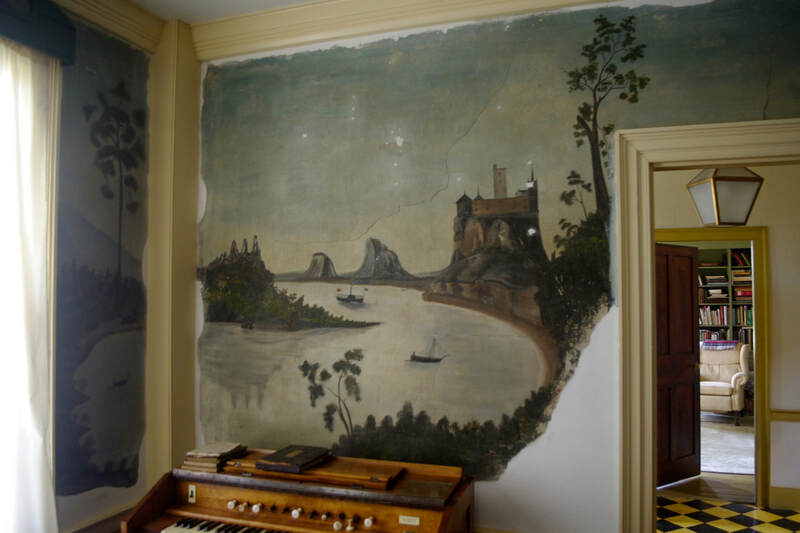 It does not look like that now; only a piano there gives it away today. The walls to the rooms to the north were designed to be moveable, creating a room nearly 26x27'. The floors were spring-loaded for better dancing. This area features a swirled rose-colored light fixture. To the south are 2 rooms, a small Sewing Room (8x11') and a Bedroom (16x16' + 8x11') complex with its own bath. And a fireplace of course. 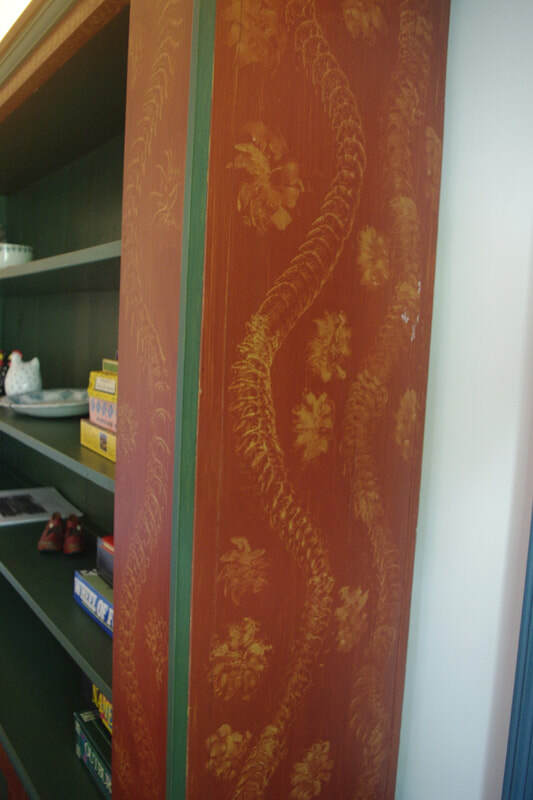 To the north, in former ballroom space, is a 16x16' Bedroom with a fireplace and a wall of cupboards. Behind it is a Storage Room and a full bath, as well as walk-up access to the Main Attic. The main attic was once used as a semi-secret meeting space for the Masons and it has a vaulted plaster ceiling at one end. 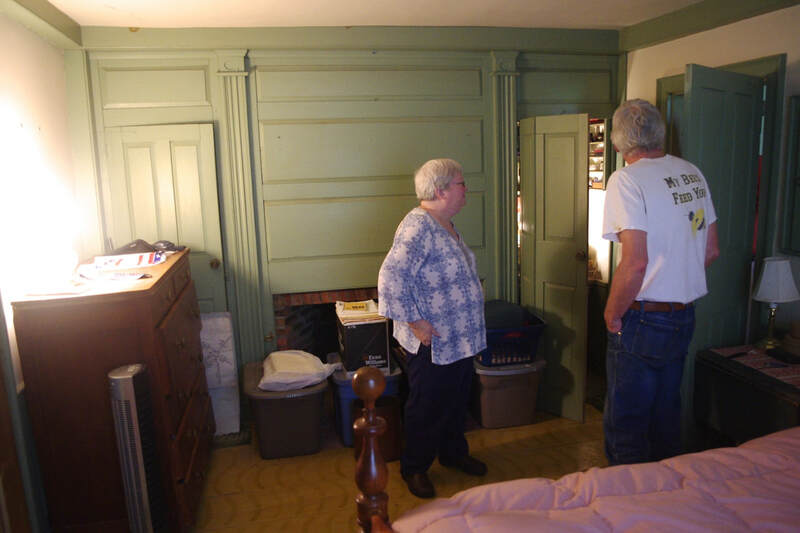 Behind this area is the Drover's Room, now used as a study or extra bedroom and behind it another bedroom. At the very end is a 2 roomed Laundry Area with a former compartmented grain bin providing space to hide dirty clothes until you are ready to wash them. There are additional storage cabinets here as well. And at the very end you look into the second story of the woodshed. Let's go outside now and explore the buildings there. In the front is a small one-room former Doctor's Office. It was on the property, got moved away decades ago, and when the owner had a chance to bring it back, he jumped at the opportunity. A Blacksmith Shop of 2 rooms is located to the side of the tavern. It no longer has the equipment so cannot be used for that again without restocking. In the back is a carriage home. 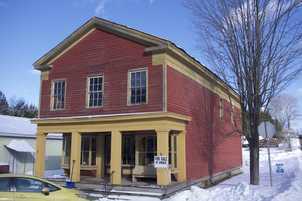 It is 2 story with an office in the loft, and is used for storage today. It needs work. In the very back is a 2 room free-standing Milkhouse. You will get over an acre of land here with the lines extended some feet beyond the original lines to the area now defined by the lawn. Behind this is additional land that the family owns, deeded separately. There are 35 acres to this piece. 8 acres are a field, and the remainder is woods and abandoned pasture. A stream flows through it and at the edge is small waterfall. If you wish to add this land for $69000 more, you will also get a good large barn as well. Or they could subdivide and sell just the part you want, retaining the rest. They are also willing to give you deed restrictions on this land to require it to stay undeveloped and agricultural. 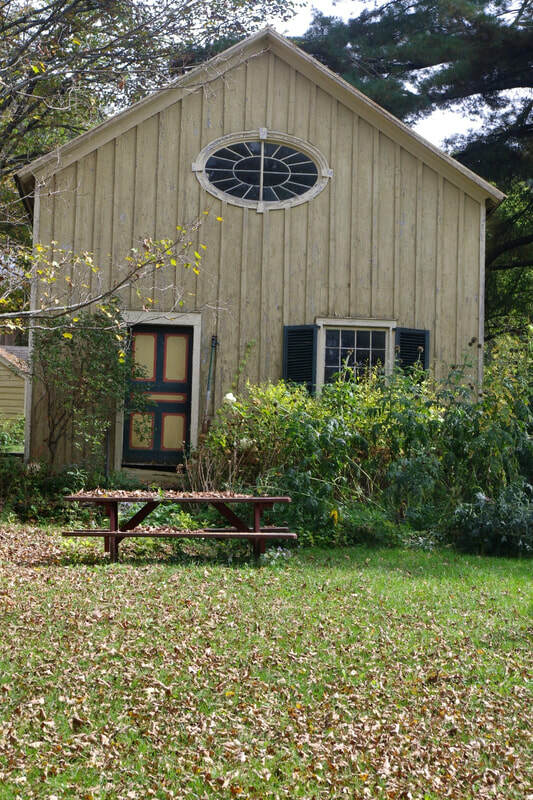 The home property of 1 acre, the tavern and historic outbuildings, is priced at $357000. Taxes, on everything they own here (all 35 acres), total around $10000 and no deductions have been taken by the family. Your figure should be significantly less. If you want the additional 35 acres and the barn on it, remember to add $69000. Let's give the heirs an offer they cannot refuse and let them get on with their lives. Note: we have for sale nearby an historic country store + 2 very original homes. Ask us about them too. They are below. 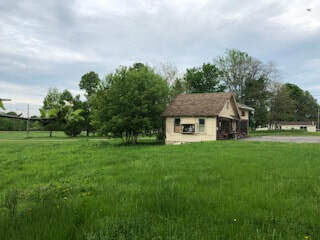 #1138 Schoharie County - We have a home with just over an acre (1.05 acres) in a beautiful country setting just outside Cobleskill, less than 5 minutes to shopping and the sought-after Cobleskill-Richmondville School District. You will love the long pastoral views. No fast traffic whatsoever - there are stop signs by the home. The lot has been beautifully landscaped with low stone-walled terraces, and a variety of trees, strategically placed: catalpa, maple sugar, willow, apple, sycamore, spruce, red pine, and - walnut. It features a circular drive. If you like natural wood, you will love this home. It has been thoroughly remodeled with new siding, new doors and windows, additional insulation, and updated electric and roofing. If has the cheapest heat out there, piped natural gas. Good water from a drilled well. The east side of the home features a front porch facing the view and also an unique overshot “porch”. The west side has a wide cement patio. Inside are 10 closets, many of them quite large. There are 2256 square feet of living space and it has a 3/4 basement. 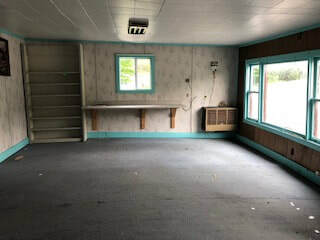 Inside you find a large family room (14x24’) with a new hardwood floor and a decorative and functional gas parlour stove. Beyond it is a country kitchen (12x20’). 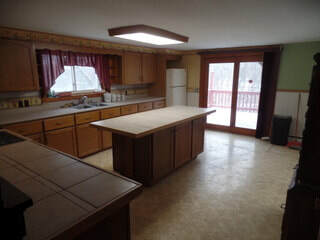 This has a new hardwood floor as well, recessed lighting, new tile countertops, dishwasher and refrigerator. 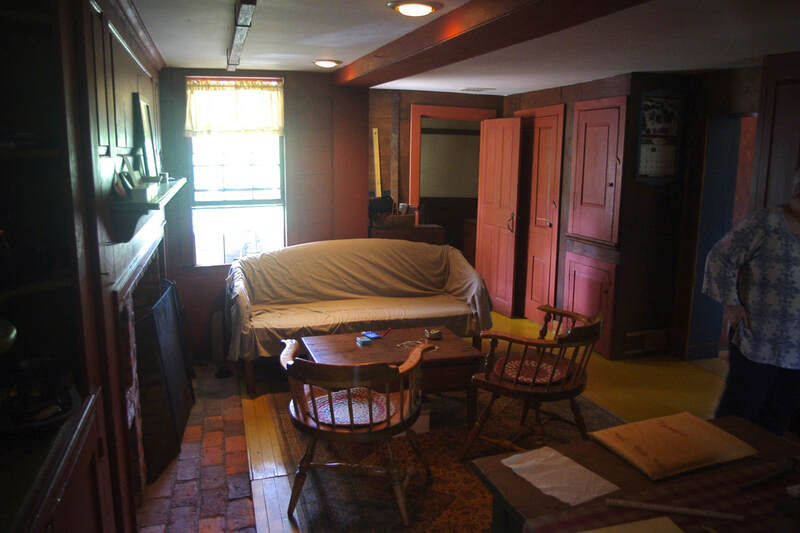 It features a huge original fireplace and a pantry as well. There is room for a small dining table too. In the center of the home is the large formal dining room (14x15’). 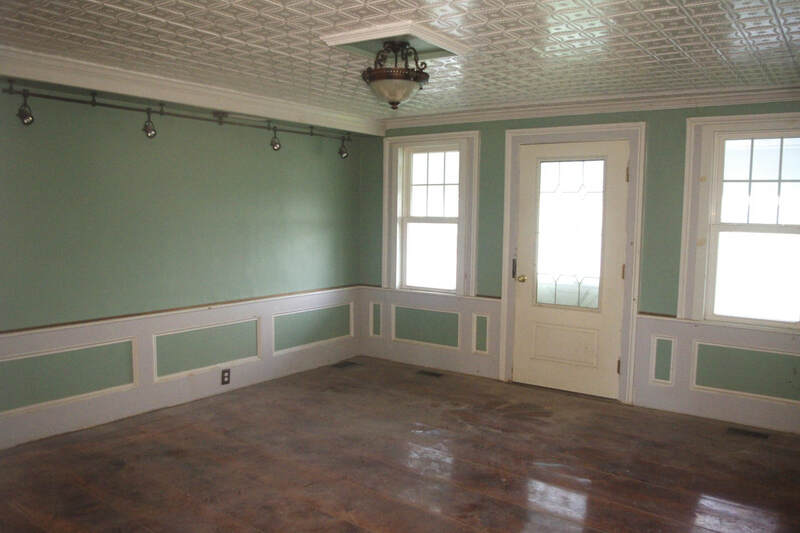 It has wainscoting, refinished plank floor, stamped tin ceiling. Off of the dining room is a refinished plank-floored bedroom (9x11’), a wainscoted-wall full bath, also with the tin ceiling, and the living room (14x15’). 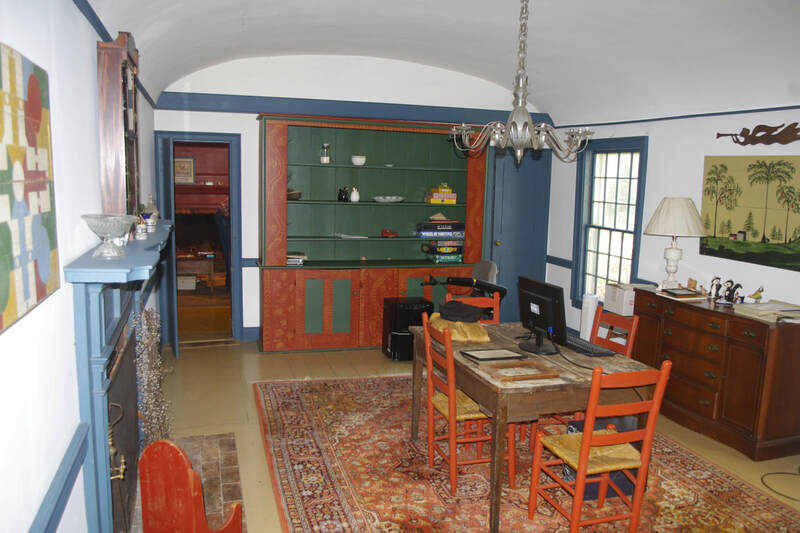 This too has refinished plank floors, a mock fireplace and a woodstove. It could be used as a bedroom as well. 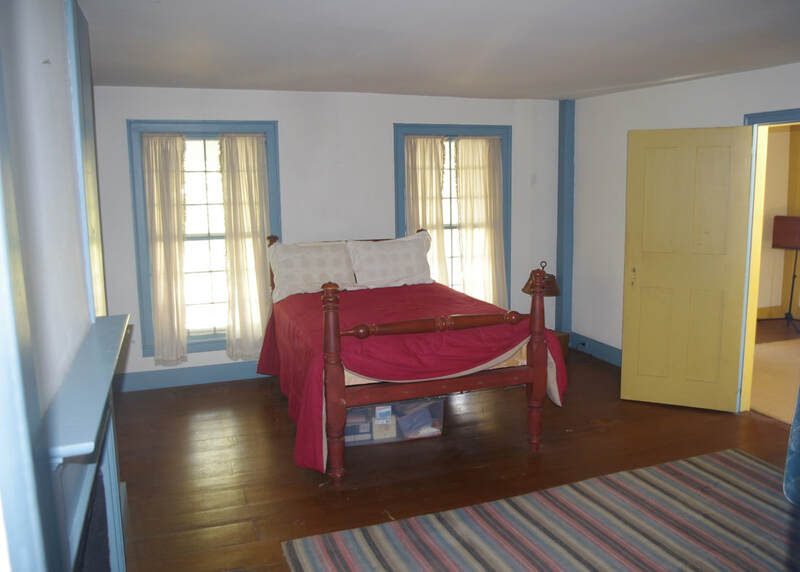 There is a laundry/half bath (8x11’) which adjoins both it and the bedroom. 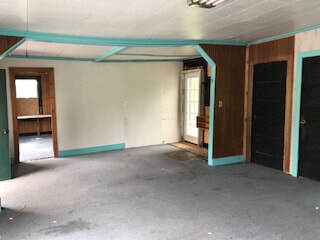 It has wainscoted walls. A mud room (10x11’) with 2 outside entrance doors is the final room on the first floor. There are 2 stairways leading to the upstairs portion of the home. The main stairs leads to the master suite. This has a large bedroom (15x18’) with a pine ceiling, new hardwood floor, and an oversized L-shaped bath (9.5x18’) with a large tile shower, pine ceiling, tile floors, and huge closet space. A back stairs leads to 2 rooms (13x15 & 12x13’) featuring new hardwood floors and a walk-in attic (16x24’). There is also a large old barn with space for 4 vehicles, a workshop, small animals, plus storage space in the loft. L-shaped, it is ~45x85’. There is also a big welding table included here. This is priced to sell at $159000. This is owned by Vinyard’s Choice. For the right person, we may be willing to help you out and get you in quickly as needed. With no Star or deductions figured in to reduce the amount, taxes should be about $3500. Take a step back in time with this original country store, unchanged since the 50's. 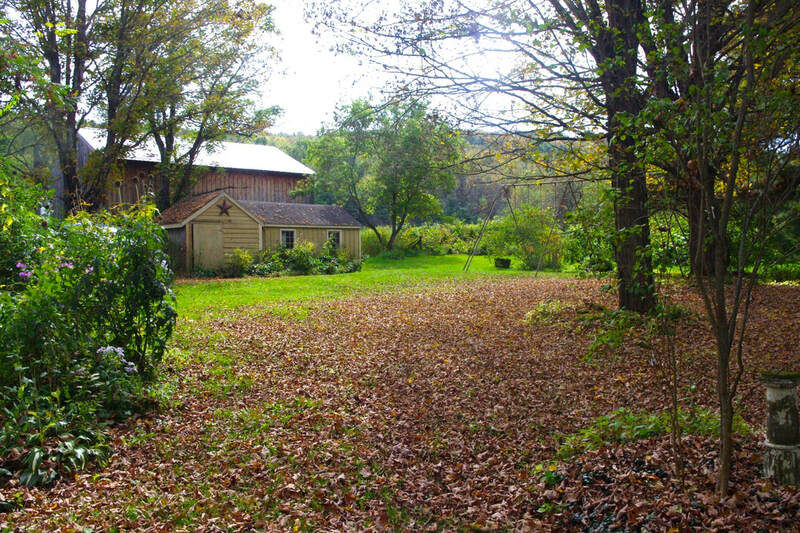 It is in fine structural shape and sits on .13 acre in a tiny hamlet just outside Cooperstown. It enjoys a corner lot with stops signs, so everyone has to see the store and no one can go fast past it. 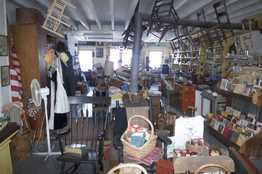 It is currently used for antiques, curios and collectables and the family could make the stock available if desired. Dating from the mid 1800's, it is 55' long and has a completely rebuilt basement, done to stabilize the property for generations to come. The main floor is one gigantic room, with copious shelving on the sides, tables in the center. The counter is still there and stays with the property, along with all the shelving. Heat is by a single wood stove. There is electric, but no water or bathrooms. On the second floor are 3 rooms, l one large and 2 more normal sized. I believe the smaller rooms were once used for living quarters, and the larger one for storage. I should add that we have a home right across the street that is for sale and would take good care of any living needs a new owner might have. ​The upper floor, the attic, is strictly storage. but it features an amazing geared freight elevator, once used to haul items to the second floor or attic. Double doors in the second floor allow items to be moved inside easily. I can see this being employed for any number of uses: country store, warehouse and store for an internet business, craft shop, home, light manufacturing... And at the low price of $58000, any of this is feasible. Taxes are just $1641 total and the property (along with the neighbors – it is in an Historic District) is protected with covenants so that the historical character of the area remains intact. #1127 - Northern Otsego County - Location, location, location - this lot has it. On the main drag of a country town far from large towns, and adjoining the new supermarket plaza, in the hottest area for development, we have a 1.2 acre lot (198’ X 268’). It has ample parking, high visibility, and is zoned commercially. There is 417’ of road frontage on two roads as it is a corner lot. The terrain is level and well-drained. The owner asks $125000, but don’t be shy in making your offer as all offers will be seriously considered. Taxes are only $1465, cheap, and the low taxes will only add to your margin of profit. Amy Stetson is the agent most familiar with this. For an in-hand description or to view it, give her a call at 518-332-0158. 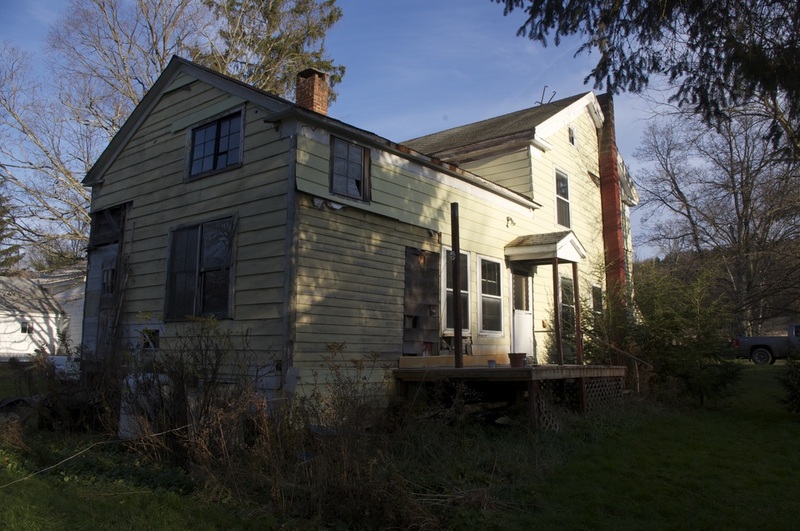 #1108 Eastern Otsego County - Unspoiled home in an Historic District of a hamlet just outside of Cooperstown. It is in good condition, meaning, yes, work needs to be done, but not too much. Everything works and the family living there is comfortable. 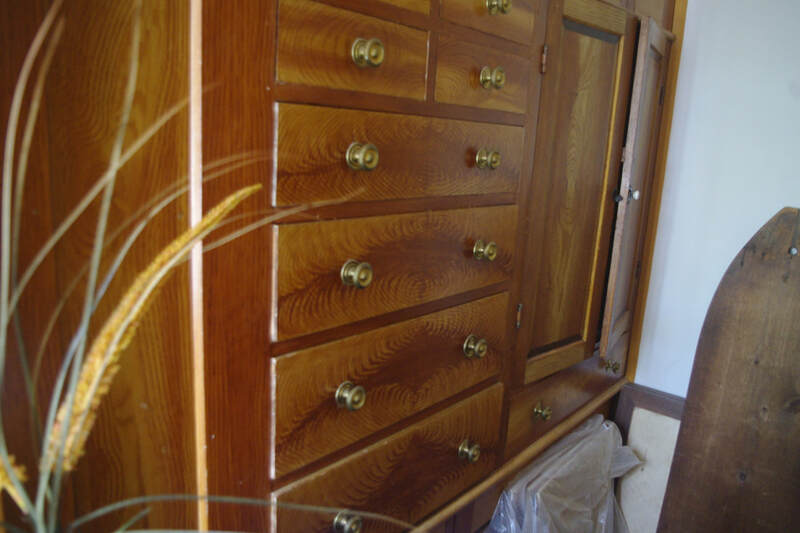 The woodwork is superior and in fine shape - stairways, moldings, baseboard, doors, floors (plank). There is minor plaster work needed and lots of wall papering or painting. Windows are 6/6. More insulation would increase the heating efficiency. A drilled well gives all the water you need and a septic takes care of what's left after you are done with the water. The home stands on a ¼ acre lot, mature landscaping, quiet, and zero fast traffic. There is a side porch, classic lines, 4-slope roof. It has 2289 square feet of living space and has 4 bedrooms, all upstairs. Downstairs is a double living room, a formal dining room, and an old-fashioned kitchen with hardwood floors. Floors elsewhere are plank. A u-shaped stairs connects the floors and there is also a back stairs as well. The bath is on the second floor. Refrigerator and stove stay with the property. ​This is priced to sell - $59900. Taxes are merely $1775. There are covenants in the deed to insure its historical appearance and use remain intact. A classic Greek Revival home with a just-finished complete interior remodel. 1800 ft2 of living space, too. And it's in the sought-after Fonda School district, ~ 10 minutes to town. It sits on its own acre and is surrounded by farmland and country views. There is a formal side hall with the original staircase and flooring, only it has been rotated 90 degrees from what is most often found. (There is also a back stairs, so there are 2 ways to the second floor.) 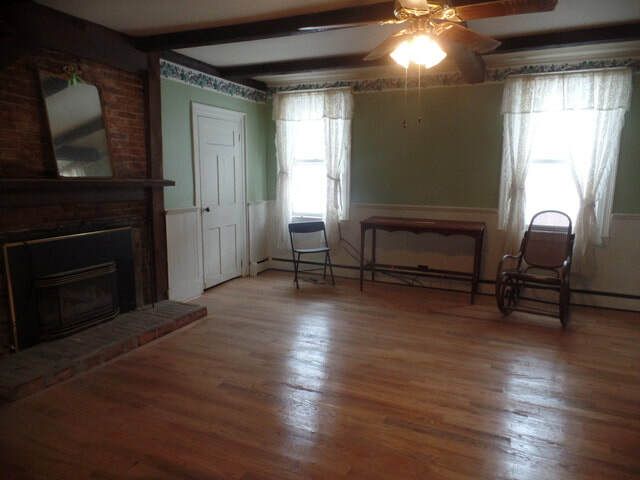 On the first floor is a 16x16' dining room with its original wainscoting and paneling. Several doors lead to other rooms. It features a new wide plank oak floor and a fireplace (not useable - the chimney was truncated years go). Off of it to the East is a 16x18' living room, bright with many large windows and refinished plank floors. A door from the dining room to the east leads to the eat-in kitchen. This features the pumpkin pine flooring which matches the rest of the home. 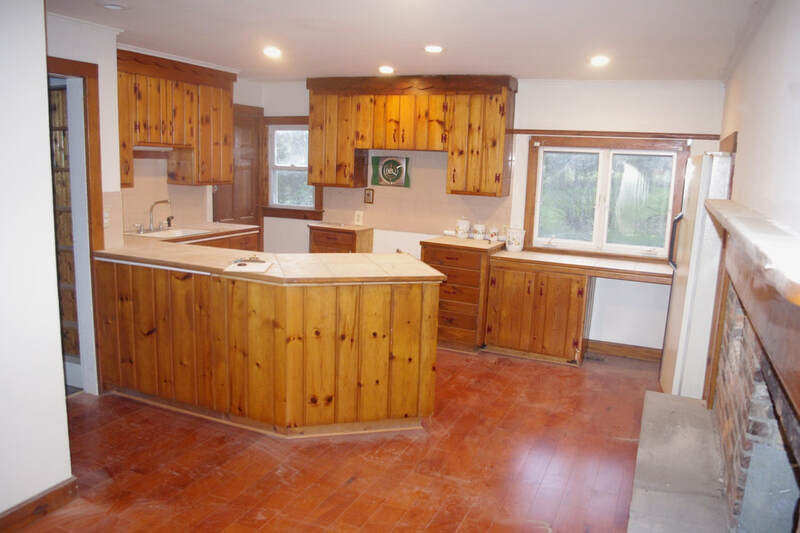 Cabinets are hickory and the countertops are ceramic tiled. Beyond this is a downstairs bedroom. Off the dining room is also an old-fashioned pantry and a full bath. All the downstairs rooms have 9' ceilings. Upstairs are 2 bedrooms. The master bedroom is large and the other one is small. All bedrooms have full closets. At the head of the back stairs is a full bath (shower, no tub) which affords some privacy to anyone using the master bedroom. This room features a mock fireplace and painted plank flooring. The smaller bedroom features pumpkin pine flooring like the two hallways enjoy. The gas hot air furnace is <7 years old. Most of the roof is also <7 years old and the plumbing has been updated along with some of the wiring. The entire home was sheetrocked a few years back. A laundry area is in the basement and another is in the pantry. The basement is full, but not of a quality that would lend itself to living space. Figure on it for rough storage only. Assessed at FMV of $134500, this can be bought for $129900. Included are a flat top electric stove, a larger refrigerator, and a washer (all "as is"). As it is owned by Vinyard's Choice, a qualified buyer with 10% down can get generous owner terms, making this a great place to buy as well as to live and raise a family. Taxes are around $4000. #1091 East Central Otsego County - CHECK OUT THE CRAZY-LOW PRICE (Just reduced) Historic handyman colonial in an historical area. Restoration has been started, you need to finish it. There is .48 acres here with 97' of frontage on a County road east of Cooperstown. Nice lot, and there are others nearby (from the same estate) so you could buy several to create a family compound. This center hall colonial has 2424 square feet of living space. Downstairs is a dedicated library, a nicely finished space with a mock fireplace. Across the hall from it is a living room with an oak floor and low-sided wall paneling. The other floors in the home are plank. Behind it is the former kitchen, which might be better utilized as an office. Behind it, at the end of the hall is a room that would make a wonderful large county kitchen. There is also a full bath and laundry area on the ground floor. At the very end is a storage room that could be made over into additional living space if you felt you needed it. Upstairs are 3 bedrooms and a very large attic. The attic could be made into 2 good-sized bedrooms if you didn't need the storage space. Two of the bedrooms are large and the third is small. There is a full bathroom upstairs. Never let a pre-teen pick her own color. The stairway has some striking – and unusual – flamed ample newel posts. The rail and the ballisters are cherry. The corner beans in the home have been exposed. The home is serviced by a dug well with a jet pump, and it has oil hot air heat, and an 100 amp electric entrance. It need a new roof and siding repair as well as other handyman improvements. The basement is partial. Taxes total $2186 and the County figures its “as is” fair market value at $115405. Not to fear, it needs work and we recognize that and at just $20000, think of the updates you can do.. There are deed covenants to assist in retaining it's old character. Other nearby homes also have these. Didn't find exactly what you wanted? We maintain good relations with our competitors and, even though they do not specialize as we do, once in a while one of them will have a place. If you spy one, let us know and we will work with it for you. You have spent time with us so we could see with your eyes. We don't have to give up our good working relationship.